It seems almost too simple and fast to be true, but with only 5 minutes of ‘resting or rising’ time, it turns out just as delicious as dough that needs to rise for an hour or more. Dissolve yeast in warm water and stir in remaining ingredients. beat vigorously 20 strokes, or use a mixer. Let rest only 5 minutes. 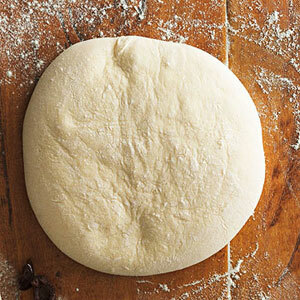 Then with floured hands, roll out and shape into pizza crust. Bake pizza on parchment paper and a pizza stone or an insulated cookie sheet at 425 for 15-20 minutes.